By actively involving customers in running the business through co-innovation and ongoing member support, giffgaff has overtaken more than 160 competitors in the UK in terms of subscriber numbers to become the country’s third-largest MVNO after Virgin Mobile and Tesco Mobile. How has community been the key to their success and what can you do to become more community-based in your business approach? 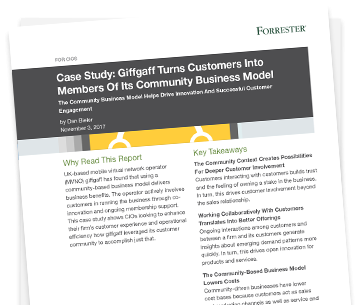 A community-based business model can be the key to digital transformation and to engaging customers in a way that drives loyalty and self-perpetuating growth.